Tonight, I completely impressed myself. Usually you attempt to make chinese at home and it's nothing close to what you get out, but what I made tonight was equally as good as anything at a chinese restaurant! 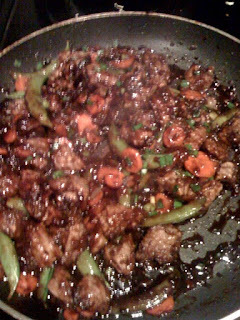 With the help of the Whats Cooking ladies, I got two incredible recipes, one for Mongolian Beef and one for Kung Pao Chicken (George likes it spicy!!). I would recommend these to anyone, its a lot healthier than eating out, totally fulfilled my craving and was easy. I made two at once so if I can do it, so can anyone. 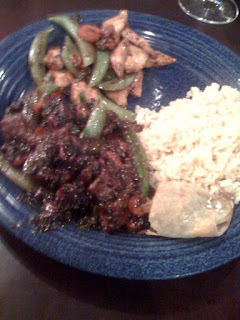 I adapted the Mongolian Beef from here at Cook Like A Champion and the Kung Pao Chicken from here at Proceed with Caution. Add chicken and marinade ingredients to a bowl or ziplock bag, adding the cornstarch last, and marinate for 25 minutes. Meanwhile, slice carrots and any other veggies you want to put in. Chop the green onions into 1/2 inch pieces, and grate the garlic and ginger(or just use the pre-grated like I did). Heat a large saucepan or wok over medium high to high heat. Add olive oil and allow to get hot. Add carrots and veggies and toss occasionally until cooked. Remove vegetables from pan.Add olive oil to pan and allow to get hot. Add marinated chicken and cook until nearly done. Remove chicken from the pan. Add olive oil to pan and allow to get hot. Add garlic and cook for 30 seconds. Add red pepper flakes and ginger and cook for a few seconds. Add the sauce to the pan and bring to a boil. 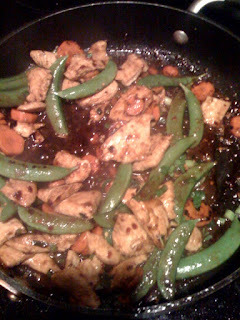 Return the chicken and vegetables to the pan, toss to coat in the sauce. Stir in the peanuts and green onion, heat through. Remove from the heat and stir in the sesame oil, if using. Serve with rice. Add the green onions (a pinch reserved for garnish), stir, and remove from heat. I'm glad you liked it and I love your addition of sugar snap peas! I'm going to have to try that next time!